James J. Tissot, ‘The Valiant of Gibeon’ (1896-1902), The Jewish Museum, New York. Click for larger image. OUR OLD Testament study this week moves to a new phase of David’s life as he is declared king of Judah. The rest of the tribes, however, elect to follow Saul’s son, Ish-Bosheth (called Eshbaal, or “man of Ba’al”, in 1 Chronicles 8:33), who decided that Saul’s headquarters at Gibeah was just a little too close to the territory of Judah, David’s tribe. DAVID IS on the lam as our Old Testament study continues, running for his life from the mad king, Saul. The king was so angry that the priest Ahimelech unknowingly helped David escape that he ordered the deaths of all 85 who wore the ephod in Nob, the city of the priests, as well as their families and animals. 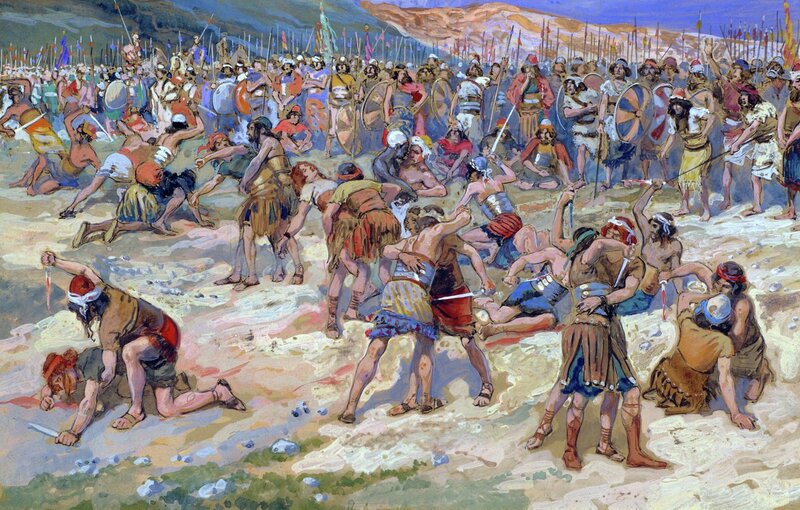 Saul again reveals his true character by completely destroying a city of priests of Yahweh after disobeying Yahweh’s command to devote the Amalekites to destruction.